Thursday is an open, pay what you can dress rehearsal. We expect to start at 8:30pm, but this is not a guarantee. As a dress rehearsal, there is a chance of delays or partial cast performances. 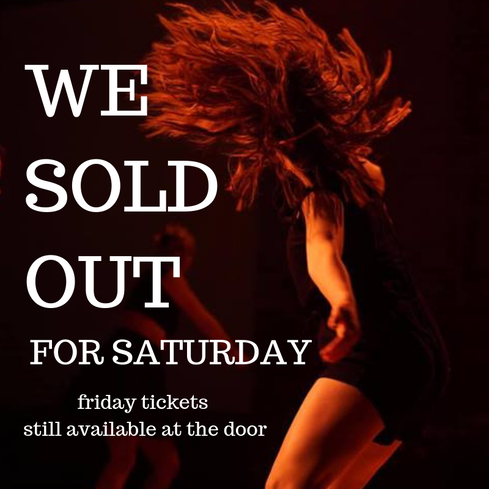 All tickets sold at the door are $2 more--save money by buying ahead of time If you wish to support one of our guest choreographers with your purchase, you must list this either in the questionnaire or by email when you purchase your ticket. Premium- $30. Enjoy premium seats and a free drink or snack from concessions. Artist- $15 (1 discount ticket per transaction). This is a discounted ticket for professional artists. (visual, performing, etc). List your artistic affiliation in the questionnaire at the end. You may be asked to provide industry proof at the door, such as a professional website. Artist party- $13 (Max 4 tickets). Get together a group of four artists and get $2 off each ticket! Be prepared to show proof of industry for all party members. Open Dress Rehearsal starts at 8:30pm. Shows on March 1-2 start at 7:30pm. ​If you are late, you may need to wait until the first work ends before entering the space, so please plan accordingly. ​The show is at the Drucker Center, which is a part of the Menomonee Club for Boys and Girls. There is a parking lot, but parking often runs out. If you are concerned about finding a spot, consider using Spot Hero or Park Whiz. The North/Clybourn L stop is very close. CHICAGO, IL, January 10th, 2019 — Contrary to popular belief, we don't build our identities solely from grand statements on social media, controversial hashtags, or arguing with that crazy uncle at Thanksgiving. Instead, we establish ourselves in our everyday conversations, our music, our friends, our faith, our response to stress. In a time of uncertainty and radicalism, it is crucial to know ourselves. Our identity creates context for everything around us—it is the stable anchor in the storm. Whether on the battlefield, at the altar, or in friendly banter, we continue to reassert, redefine, and reshape our image of ourselves. We make dances, in part, to remind us who we are, which in turns helps us make sense of everything around us. 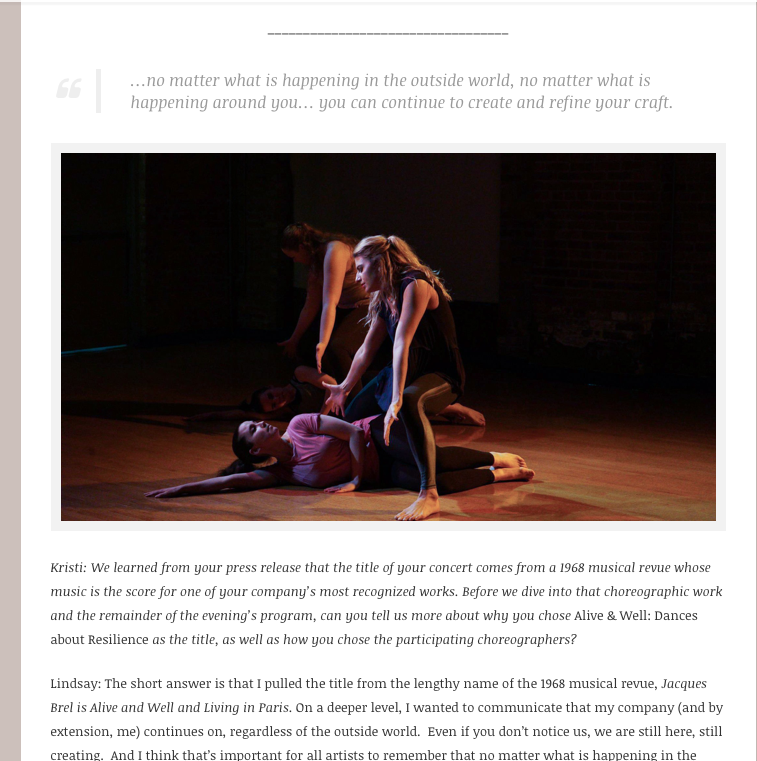 “Alive & Well” features work from a diverse group of choreographers exploring resilience, connection, and self-affirmation. J. Lindsay Brown's piece, “Atheists in Foxholes”, examines C.S Lewis' and Tolkien's relationship with God, setting existential crises against the backdrop of World War I. Brown also restages humorous and declarative improvisation score, and expands one of the company's best known works set to music from the 1968 musical review “Jacques Brel Is Alive and Well and Living in Paris”. But that's not all! Alive & Well presents works from a wide range of choreographers, using a variety of styles and perspectives. Works include the choreographic debut of Haley Stueber, the first participant in J. Lindsay Brown Dance's “New Choreographer's Initiative”. Kaitlyn Dessoffy offers a fresh, entertaining look at auditioning as a trans performer, while dynamic duo Bailey Johnson and Rachel Vogeney examine our planet from an alien perspective. Katherine Dorn, Dani Koeck, Katherine Scott, Joanna Taubeneck, and Stephanie Terrell team up to present “(dis)affinity”, which focuses on collaboration and self-actualization. Additional works from Jaimee Jaucian, Gabriela Ortiz , Lauren Reed, and Timothy Tsang. J. Lindsay Brown completed her MFA at the University of Michigan in 2013, where she focused on choreography and dance education. Her choreography ranges from screen dances to formal evening-length works in the round, covering topics such as Guantanamo, classic literature, and space travel. Her works have been performed indoors and outdoors, in arcades and onstage. J. Lindsay Brown Dance has performed in the Elgin Ties Dance Festival, Going Dutch, Delve, Chicago Dance Month (at the Chicago Cultural Center), and other dance festivals. Lindsay has performed works at Dance Chance, New Room, at various historical buildings, and as the only dance artist at Two Pence Theatre's Thus Die I: thus thus thus and at Bard Party: Where Anne Hath a Will, Anne Hathaway. She presented Doors Opening: a collection of danceworksfor the community as part of Loyola University Community Relation's Summer on the Plaza festival, has participated in various Arts Walks showcases, and produced Movement Zoo,an interactive site-specific dance installation at Indian Boundary Park in 2015 and 2016. In 2015, she collaborated with The Glitter Island Gang to produce Spectacle Spectacular! A Fully Improvised Song and Dance Musical, which sold out both shows and brought back to Chicago by popular demand in 2016 and 2017. She has produced five full-length concerts since 2013, and also plays the cowbell. Want to know more about Lindsay's process?